So a quick run down on how she got to this point. First her armature was made, obviously the legs were made longer and then bent to include the extra limb. 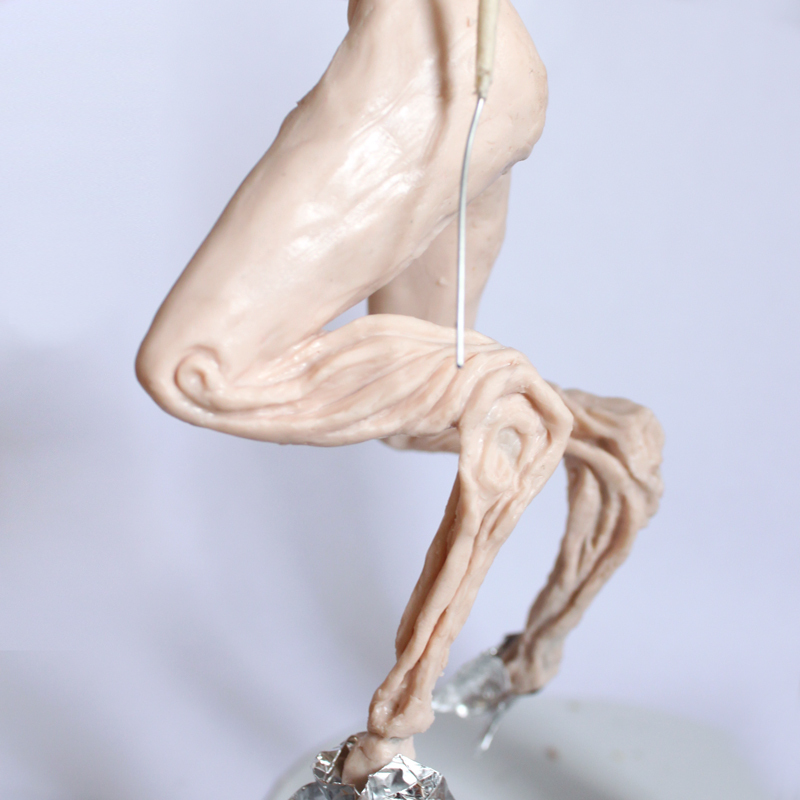 The armature was then covered in tighly compressed tinfoil to bulk up the thicker areas, such as the torso and thighs. The tinfoil, and any armature wire not covered in tinfoil, is then completely covered in masking tape. As you can see in the picture I haven’t finished covering the lower arm, but I will do that before I add clay to that area. Once that is done I have added clay to her torso. I add bits of clay blocking in the areas until I have it looking right as far as proportions go, then I push and smooth it altogether to ensure there are no gaps or air pockets in the clay that can cause problems when cooking. I then did the same process with the legs. Usually the legs are done later, but I tend to always start with the “hero” of the piece. And with a faun its definitely the cool legs! As this piece is going to have details sculpted into the areas I have just left the clay rougly smoothed – no point in spending time smoothing something that is just going to be changed. The base was made using an old light switch casing that I got from a demolition yard. I gave it a bit of a sanding, and then glued down a big wad of compressed tinfoil covered in masking tape. 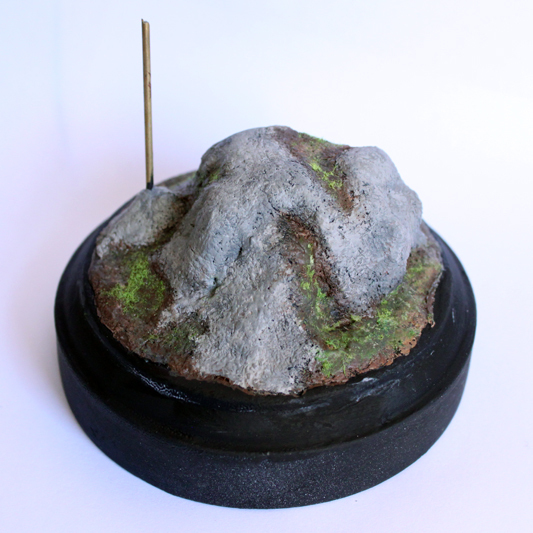 The clay is added after and sculpted to, hopefully, look like a bit of rocky landscape. Once the scupting is completed it was cooked for 30min. The heat needed to cook the clay is not that hot, so the wood is fine in the oven. After the clay is cooled the painting was done. I actually used a tutorial to help me with this, and you can find that tutorial right here. The rod was then added, which matched up to the rod in the lower leg of the faun, and the base is done. The legs were done by adding detail to each limb, starting with the lower ones and working the way up. Her two lowest limbs are earthy and tree like. They have bark lines and whorls, and they end at the main upper knee. The upper thigh area will stay as human skin, and will have sculpted fur around the waist ending half way down the thigh. So I have made sure the lower thigh is nice and smooth, while the upper thigh is left as a rough smooth, waiting for its detailing. This was fiddly work so ensuring you hold the piece right is so important not to keep squishing areas already completed. I also hang my pieces from a doll stand to help with this. And I was also giving areas finished a few blasts of the heat gun to seal the outer clay. But you must be careful with this that you don’t go into areas on yet sculptured (don’t want to set that clay before you work it) and also that you keep in mind that its only a band-aid and the clay underneath is not cooked – so you must not put any pressure on these parts or they will cause the cooked crust to crack! And now we are up to where I am currently at. The upper torso has been sculpted. She has what I hope will come out as a bark like warrior bodice. It is wrapped around her breast/chest area criss-crossing at the front, and leaving her lower breast exposed. Her shoulders have a leafy shoulder pad with frilling leaf detailing. And the bodice will be lifted up around her neck to make a bark strip high collar. To protect the front I have given it a blast of the heat gun to protect it while the back work is done. And that is where I am at. Thanks for reading and keep watching for the next stages coming soon!